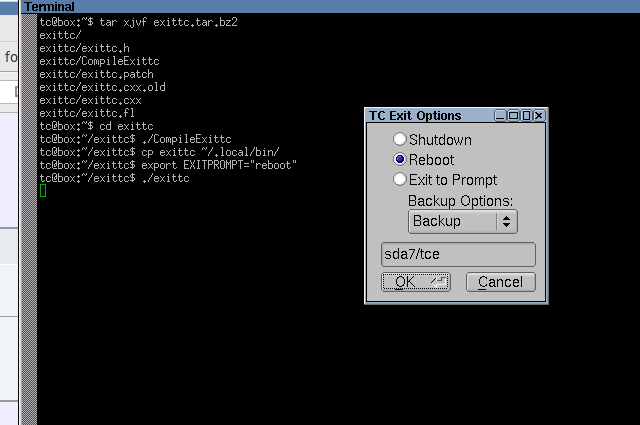 Sorry, don't put the .bz2 file in your tce directory. Place it in your /home/tc/ directory. ... That last step either has me confused and I did it wrong or some combination of the above. In either event it did not work. You said, "Finally enter './exittc'". I tried that in aterm. I tried it as sudo. I added it to the .profile file. Net result is no change, even after reboot. I did know it didn't delete anything. The point is that it re-downloaded stuff I already have. But really all that is of concern here is that it still doesn't work as per your instructions in Post #9 when we get to the last statement. I did that in aterm. I did it again with sudo. It still doesn't work for me. That worked, but not on reboot. export EXITPROMPT="reboot"If you didn't, you need to add it and reboot for it to take effect. That is correct, Sir. It still defaults to 'Shutdown' after rebooting. cat /opt/.filetool.lst >> system.txtand attach the system.txt file to your next post. ./systemstats.shUse a thumb drive to transfer the system.txt file and attach it to your next post. I did it the other way while you wrote that script. # Path to personal scripts and executables (~/.local/bin). [ -d "$HOME/.local/bin" ] || mkdir -p "$HOME/.local/bin"
[ -d "$ONDEMAND" ] && export PATH=$PATH:"$ONDEMAND"
# or Bash. Default is a classic prompt. Well, I fixed that. But still no joy. Yes. Several times since then. (For different reasons, of course). doesn't fix it, use the systemstats.sh script I attached in a previous post to get me a fresh system.txt file.